2008 Blue Stars member Liza Sisson submitted this photo and caption. 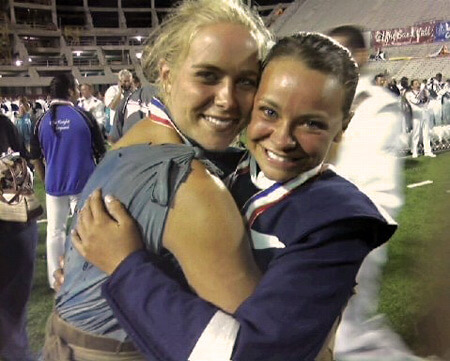 In this photo: Megan Miles (L), a Phantom Regiment colorguard age-out, and Liza Sisson (R) of the Blue Stars front ensemble. This was taken after the 2008 World Championship Finals in Bloomington. With Phantom's astounding victory and the Blue Stars' first Finals appearance since the 1970s, it was an emotional night for both of us. Megan and I met in 2006 at Mississippi State University, when we moved into the same dormitory and discovered that we'd both gotten home from tour! I had just finished a summer with the Seattle Cascades, and Megan had just gotten home from her first summer with the Phantom Regiment. We were thrilled to find each other on the field after retreat, marking the end of two historic drum corps seasons.